As I had mentioned earlier, I was going to give you all a look "behind the scenes" on how I kind of sort of made that Beauty & The Beast Enchanted Mirror (and all the reasons why I don't want to make another, ha!). 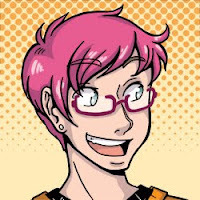 I do warn you, picture heavy post is heavy, because I'm the kind of person who likes written tutorial type things with lots of examples. At least when I remember to take photos of my work. 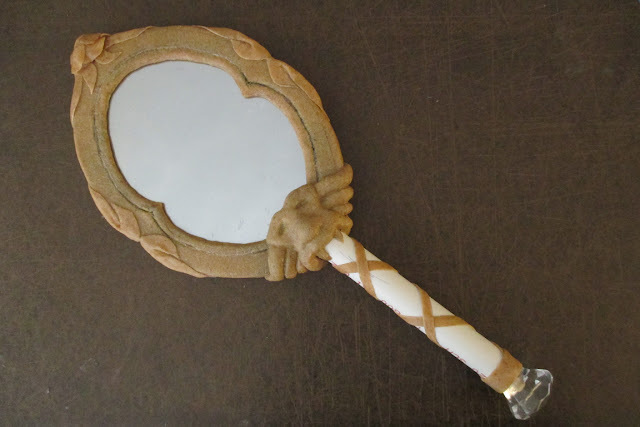 The first problem I had when making this mirror, is I had intended to use a PVC pipe cut as the handle to hold the oval mirror I had obtained from my local craft store. 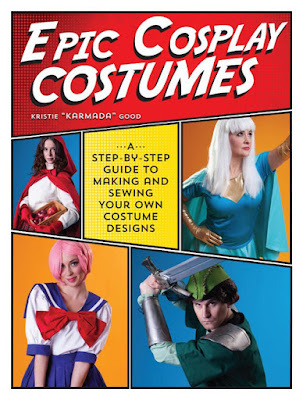 This is a bad idea. 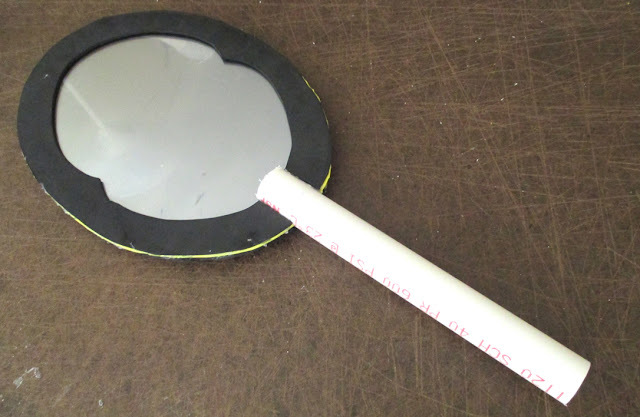 If you are making a prop mirror, and intend to take it to places it could be damaged, I found using a standard glass mirror from the store just won't cut it. ANYWAY, I was running out of options, and that's when I remembered that they made this looking glass sheen you can spray onto glass to make things look like a mirror. So I figured, what the heck, we've got some spare plastic we found at the new house, let's see if it works! The cracks showed up after I sprayed the paint in. It did! Kind of! Well, it worked close enough for Government Work, that and if it was going to be in pictures, it's probably best if it's not fully reflective. You could see stuff in it, but I wouldn't recommend using it to help you apply makeup. I just followed the directions on the can, and it worked out pretty well. We also learned that the large hot knife we used left hairline cracks all around the edge. This wasn't too much of a problem, since the mirror bezel would cover that up. Just something to keep in mind if you are hacking apart plastic with whatever tools you can find. Next came the assembly. 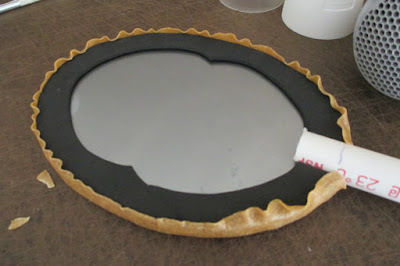 I had made templates for both the front and back of the mirror bezel, and for the PVC I had a slot cut through the center so the mirror would fit onto it, with the back half of the slot longer, so it would support the mirror, and keep it from falling out. Mirror was glued in with hotglue, as was all the craft foam. In fact, most of this thing IS hot glue. AKA, don't leave it in the sun for too long, or a hot car. 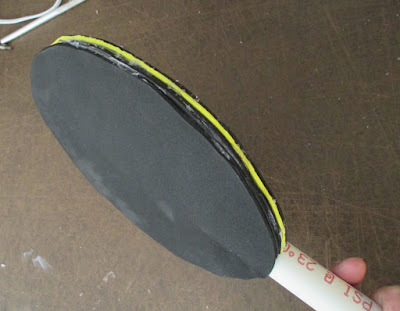 Thickness of craft foam layers. I put like 5 layers of craft foam in there (I made a little edge of foam around the mirror to keep it from pinching weird), all hot glued together. Next was the covering, to which I was going to attempt Worbla. I've been iffy on the substance, but I bought a bunch of it to work on Delita's armor with, so I figured I had some extra to play with. I made sure to leave extra around all the edges, so I could trim it off later. It'll make sense in a moment. Doing some research, I found that apparently Worbla can be heated with just a hairdryer (not just a heatgun), and I was darn scared of the heatgun right now (small space, nowhere good to set it down) I went and grabbed my trusty hairdryer! 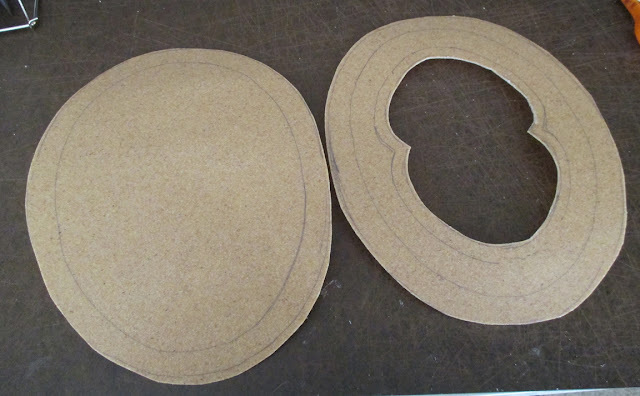 Now, it's smart to note, that Worbla has two sides: A regular side, and a "glue" side. The glue side is shinier, and that's good to know, because that's how it'll stick to all the things! I went and matched up the back piece with the craft foam, and started blowdrying it. I had to set it to High, at the highest temperature, but in no time the Worbla became pretty darn pliable. 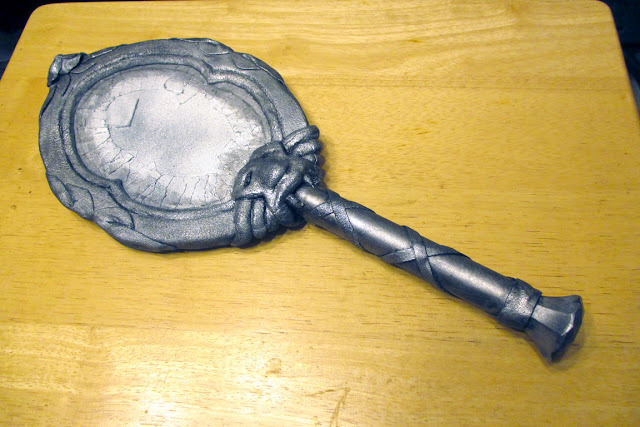 I would heat parts of it, then carefully press and stretch the Worbla around the edge of the mirror. It's not as scary as it seems. Just don't have lots of little bits that can be blown away! Whoops! I used a pair of scissors, and trimmed off that woobly part, so it was flat to the edge (as best I could). I repeated the process with the top side of the mirror, and on the edges around the mirror I folded the Worbla under the edge of the craft foam, so you can't see the foam. Then, in the part I totally forgot to take pictures of, I modeled the beast head part out of super sculpey, and then cooked it separately in my little sculpey oven. 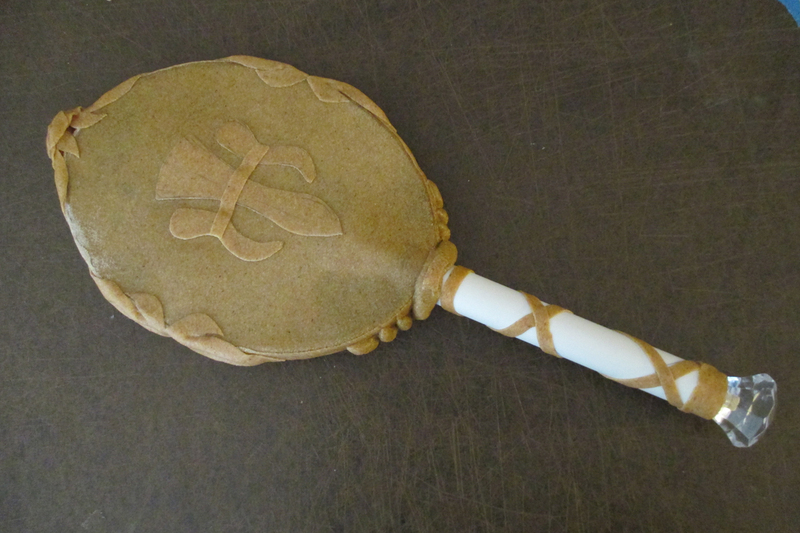 While it was still warm, I placed it onto the Worbla mirror, and held it so it would wrap to the shape as it cooled. After the clay cooled, I covered that clay in Worbla! I kind of pieced it together, but tried to smooth it out as best I could, making sure to use my Pointy Tool to get Worbla into all the crevices. I did the same for the bevel line, and the leaves I just cut out of Worbla, heated, and pressed onto the the mirror. I feel really bad I don't have that part in pictures, but I was in the zone so I totally forgot. Oh! And I also added the knob at the bottom of the handle. It's just a drawer knob type thing that I wrapped the bottom of it in craft foam, and glued it into the PVC pipe. Worbla strips were just wrapped around the pvc, and they stick because of the glue! Back detail was just heated and pressed down, with glue side adhering to the rest of the Worbla. 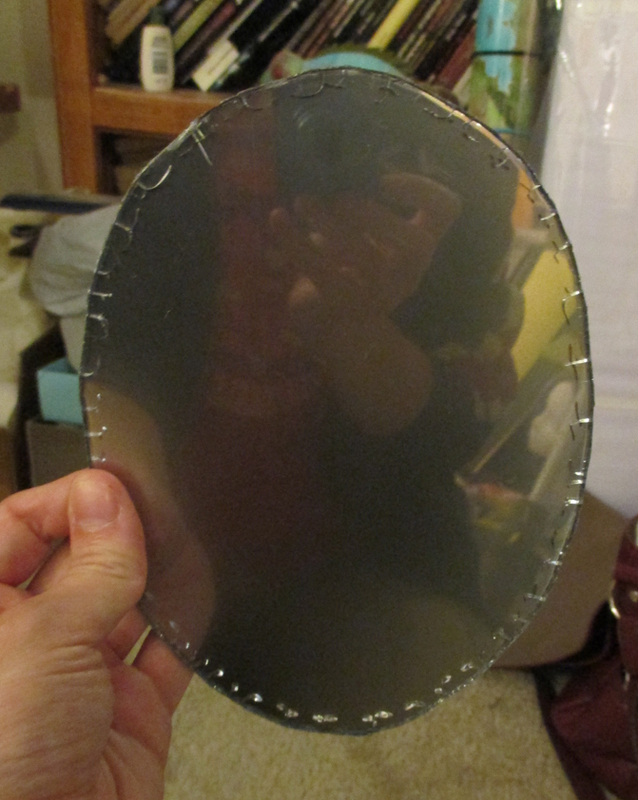 Now that my mirror was cooled and ready, I used tape and paper and created a mask on the mirror part. 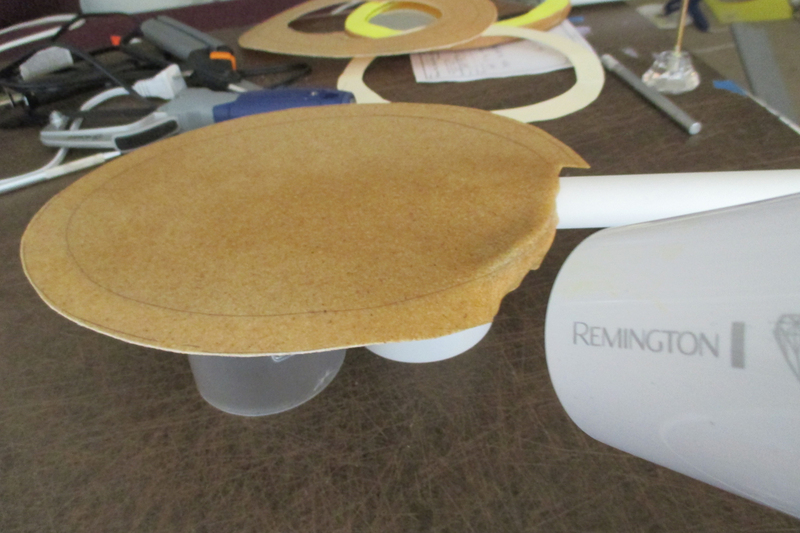 I made sure the tape went to the very edge of the Worbla edge, as I didn't want to get paint on the mirror. Then it was PAINTING TIME! PRIMER. Y U SO HARD TO FIND. 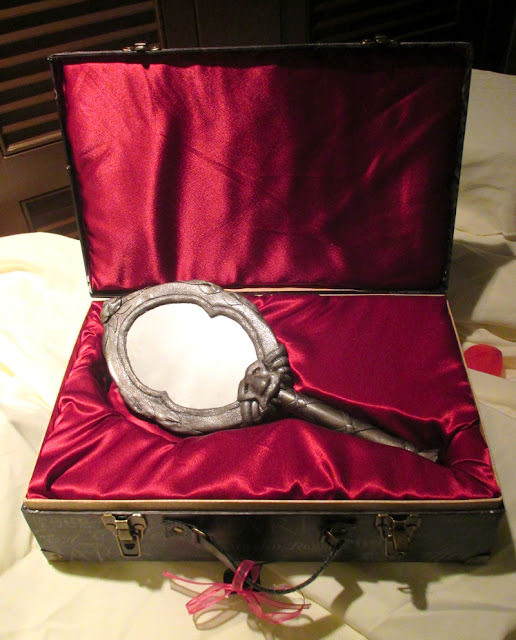 I first primered the mirror in black (why is that so hard to find now?! 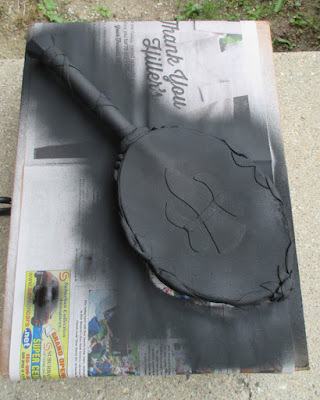 ), since I wanted it to look old and weathered later, and it in a way "darkens" the overall color. For more pristine mirrors, use a grey or a white. My next step was to spray a silver sheen onto it. I happened to have some Montana Silver spray paint from other projects, so it was the perfect choice. Don't worry, it's not gonna be that shiny when I'm done with it! I wanted this thing to look old. 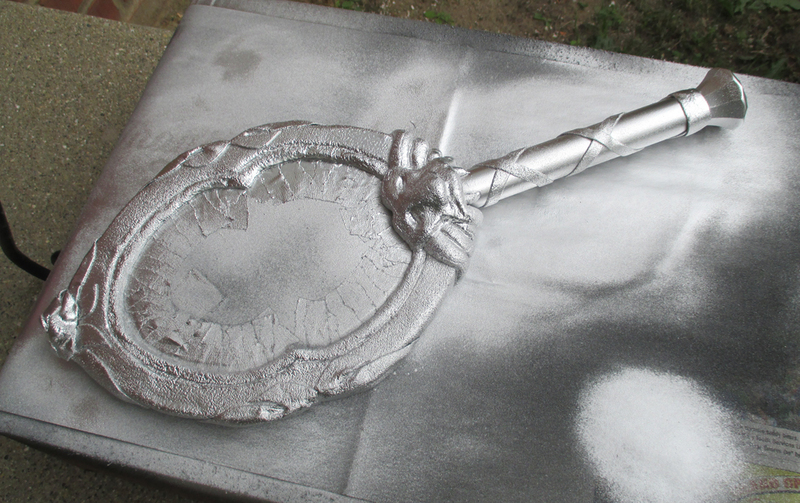 Once the silver dried on both sides (spraying in a low-humidity environment is VERY HELPFUL), it was time to add the weathering. The first layer I did was drybrush a gunmetal grey over the silver. This toned down the silver sheen, but still kept it shiny looking. Then lastly, I took black paint, added a bunch of water to it, and did several washes over the silver. I took a paper towel and would rub off some of the paint on the more "raised" areas - allowing the black to seep into the crevices, creating a lovely 3-D effect. I then waited for those layers to dry, and lastly coated the mirror in two coats of UV resistant gloss. I needed to make sure it would be handleable, and durable for convention travel! Last minute I decided it needed a carrying case, and made this from one of those decorative boxes, 2 inch thick upholstery foam and a satin I found at Joann's. Some cutting and hotglue later, and I had an appropriate vessel for it's travel! Add dramatic lighting and BLAM! Looks spectacular! And that's it! It took a lot of love and other four letter words, but I got myself a mirror! I'm pretty darn proud of it, and now you know what went into such a lovely prop!